Looking for a tough new cab to get around and adventure in? Why not include the 2016 Toyota Tacoma 4D Access Cab in your new vehicle search this year. 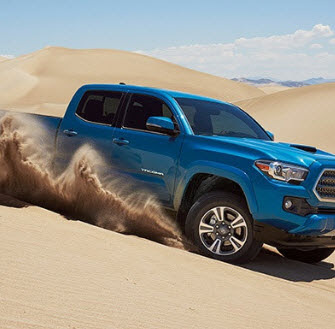 At Olympia Auto Mall we offer both new and certified pre-owned vehicles from the Toyota Tacoma range and we know that you certainly won’t be disappointed when choosing one of these cars as your wheels for 2016. According to Toyota, the Tacoma was built for the endless weekend and we couldn’t agree more. • Dual zone climate control. • Smart key with push button start. • Blind spot monitor and rear cross-traffic alert. • GoPro mount on the windshield. • 3.5 liter V-6 direct injection engine. • High strength steel used for all attachments. • Off road features including crawl control, multi-terrain select, hill start assist control, electronic shift transfer case and electronically locking rear differential. • Doors built with high strength steel to be tough and safe. At our used car dealerships in Olympia we offer both new and certified pre-owned vehicles to the market and welcome you to book a test drive to really experience what the Toyota Tacoma has to offer. We don’t doubt that the 2016 Toyota Tacoma 4D Access Cab is going to impress you, so we welcome you to book a test drive and chat to us about vehicle finance too. We look forward to you truly discovering all that this model has to offer. Feel free to contact us via email or telephone, pay us a visit or carry out an online new car search on our website in order to browse through our vehicle inventory today.